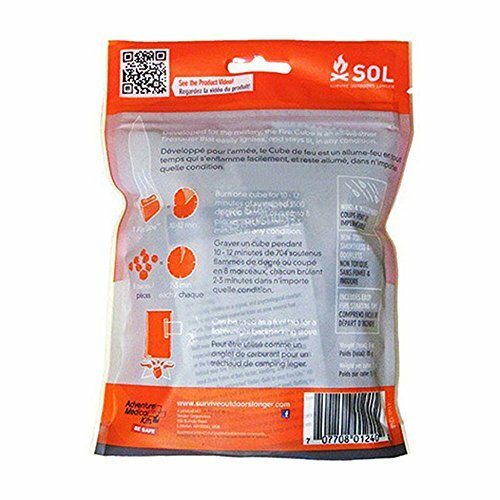 A completely waterproof collection of fire-starting supplies, each SOL All-Weather Fire Cube is a professional grade, all-weather fire starter that easily ignites, and stay lit, in any conditions. 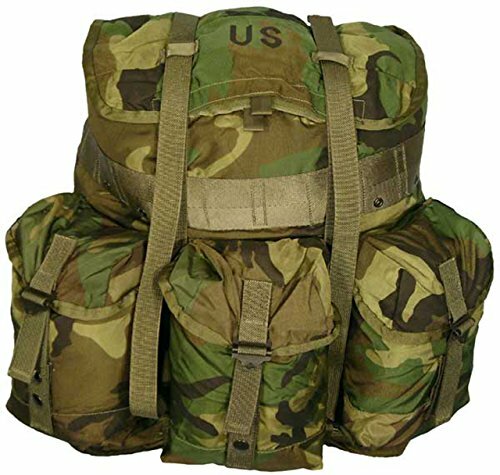 Once lit each cube will burn for 10-12 minutes with a 1300 Degree Fahrenheit flame, hot enough to boil 16 ounces of water in ten minutes or start a roaring campfire. 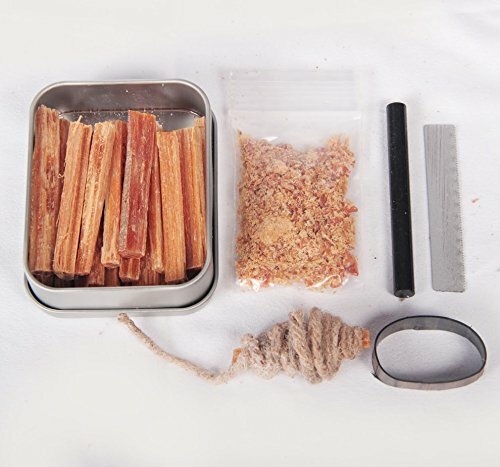 A warm fire is always close by with Survive Outdoors Longer All-Weather Fire Cubes. 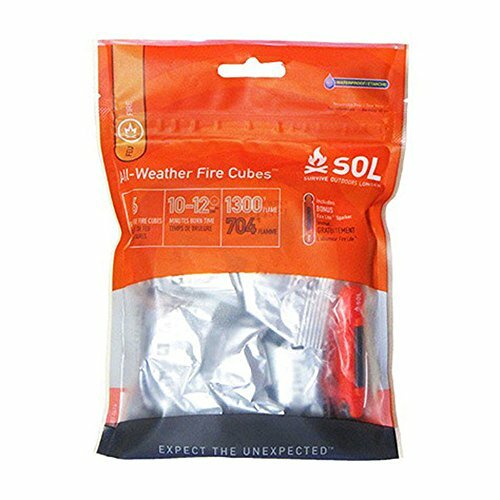 A completely waterproof collection of fire starting supplies, each SOL All-Weather Fire Cube is a professional grade, all-weather fire starter that easily ignites, and stay lit, in any conditions. Once lit each cube will burn for 10-12 minutes with a 1300 Degree Fahrenheit flame, hot enough to boil 16 ounces of water in ten minutes or start a roaring campfire. Cubes help reduce environmental impact by burning completely smokeless and odorless. Additionally, each cube can be cut into eight pieces with each piece burning for 2-3 minutes. 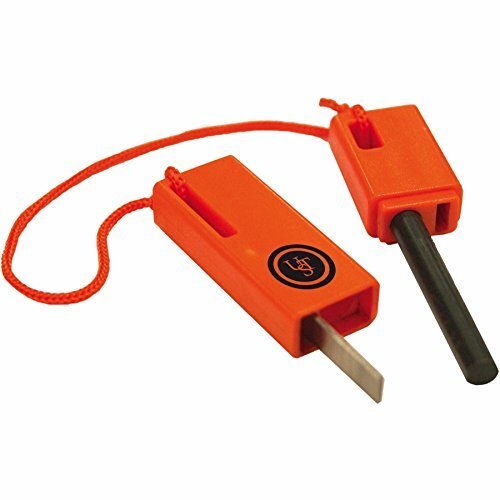 This fire starter kit includes six .2-ounce fire cubes, Fire Lite sparker, and fire starting instructions. Additionally, each cube can be cut into eight pieces with each piece burning for 2-3 minutes. 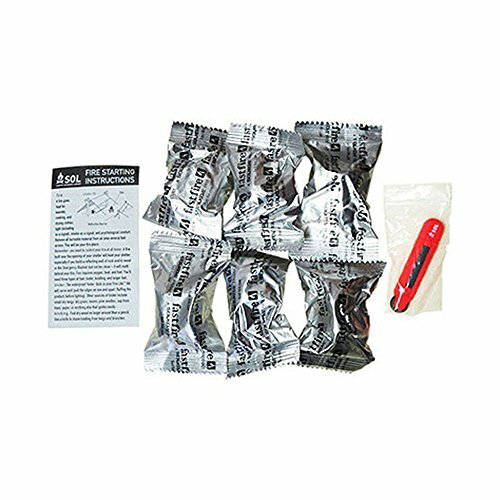 This firestarter kit includes six .2-ounce fire cubes, Fire Lite sparker, and fire starting instructions.